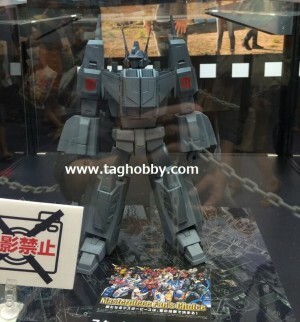 Courtesy of TAGHobby.com, we get a closer, clearer look at the prototype of Masterpiece Star Saber, from the Tokyo Toy Show. Check out the mirrored image below, and sound off your thoughts in the Energon Pub! Search Got Transformers News? Let us know here! Click here to post your comment about this news story! anyone else think he looks a little plain? grey proto's are usually the best to show off a figures sculpted details, and he's lookin kinda flat. shajaki wrote: anyone else think he looks a little plain? grey proto's are usually the best to show off a figures sculpted details, and he's lookin kinda flat. I'm actually surprised they already have a prototype to show! The announcement about Star Saber coming out as a Masterpiece was in November, and we saw the first designs later that month and then nothing until last April. GAH I haven't been this stoked about a figure in a looooong time. He's not "plain," he's "streamlined." Can't wait to see some color on this bad boy. Will most likely add to collection. Head sculpt seems very gundam like. That is a plus. I don't see a lot in the way of joints or seams that would give an idea as to how the figure comes together. I really feel keeping the Brainmaster gimmick intact is crucial. Still, no interest in getting Star Saber. Well I for one am really excited for this one. I can't tell if he's gonna have the old Brainmaster gimmick because they head doesn't look like it becomes the turret on the alt mode. Guess we gotta wait for more pictures to find out. Seeing the head size, I'm not sure if the "Battle Up" helmet will be removable to then leave it only with the "normal" face. Darkrenegade1 wrote: Can't wait to see some color on this bad boy. D-Don't report me, I'm too young. Miles Wolf wrote: Seeing the head size, I'm not sure if the "Battle Up" helmet will be removable to then leave it only with the "normal" face. Too dark. Star Saber was a righteously brightly-colored dude even in the dark depths of space. Once again from the pages of the most recent issue of Dengeki Hobby magazine via TAG Hobby we have a prototype image. Below you'll find another look at the Fans Choice Masterpiece winner Star Saber prototype that was revealed at the Tokyo Toy Show. Also feature on the page are MP-21 Bumblebee and MP-22 Ultra Magnus. I just can't wait for the preorders to start and buy it instantly. chuckdawg1999 wrote: I don't see a lot in the way of joints or seams that would give an idea as to how the figure comes together. I really feel keeping the Brainmaster gimmick intact is crucial. This is a really important point. Star Saber's transformation is so simple, if the complexity is not in his "nesting doll" attributes, we're getting screwed over. Absolutely. Is it too early to start wishing for a MP Victory Leo? 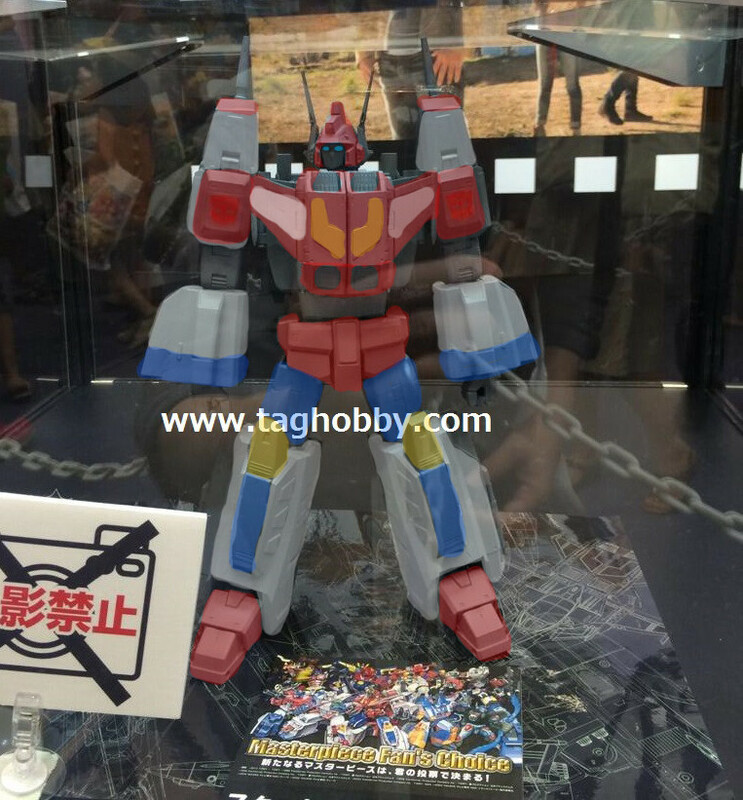 So, if it isn't too hard to transform Star Saber, will this affect the price in a positive way? Due to the fact that it wouldn't be a lot of engineering involved to make him transform. Torneira wrote: So, if it isn't too hard to transform Star Saber, will this affect the price in a positive way? That's a good question. Keep in mind that there's a general set price point for Masterpieces that Takara tries to stay within so who knows. They might load him up with little add ons to keep the price on the same level. Given recent trends, I think we can safely assume at least a baseline price of $160. 4,879 pages were recently viewed by 1,041 unique visitors. This page was viewed 1 times on Sunday, April 21st 2019 3:13pm CDT. © 2019 Seibertron, Inc. DBA Seibertron.com. All Rights Reserved. Established June 2000. Seibertron.com is owned by Ryan Yzquierdo.